Aside from tons of vitamins and nutrients, oregano also has more concentrated antioxidants than blueberries, has antibacterial properties that will help keep your entire system healthy (even protecting you from other germs on other foods), and actually counts as a dietary fiber. Worried about all the crazy infections that are now resistant to antibiotics, like MRSA? Me too! Well, here’s some good news for Italian-food lovers: in 2008, scientists discovered that the oil from oregano actually kills the MRSA bacteria better than eighteen other antibiotics! Just another reason why home cooking with your own herbs can help your family’s health. Green stalks with small leaves, kind of like mint. It also has pretty purple flowers when it blooms. 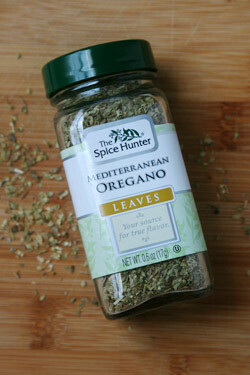 Dried oregano looks like little flakes of green and brown. Aromatic, a little bitter, and kind of warm tasting. Really good oregano eaten plain will make your tongue a bit numb. Unlike basil, oregano actually has stronger flavors when it’s dried, and doesn’t lose its goodness. I usually go for fresh things, but with oregano, I only used dried. It’s cheap and easy, it tastes great, it’s good for you, and you’ll use less of it in your recipes than fresh oregano, so it saves you money. Any grocery store, in the jarred spices section. It’s a classic pizza condiment, so you’ll probably see it in little round jars in nicer pizzerias. Fun fact: Oregano became popular in America after World War Two when soldiers who had been stationed in Italy brought the “pizza herb” home with them. No need. Just scoop, pour, or shake it directly out of the jar. You can use it in recipes, or sprinkle it right into salads or dip- ping sauces or over pizza. Store the jar in a dark place, like your cabinet. It will last from six months to forever. It will never go bad, but it will lose its flavor eventually.